MIAMI, Fla. (Sept 25, 2012) - San Antonio Scorpions forward Pablo Campos has earned the 2012 NASL Golden Boot award, given annually to the player with the most goals during the regular season. 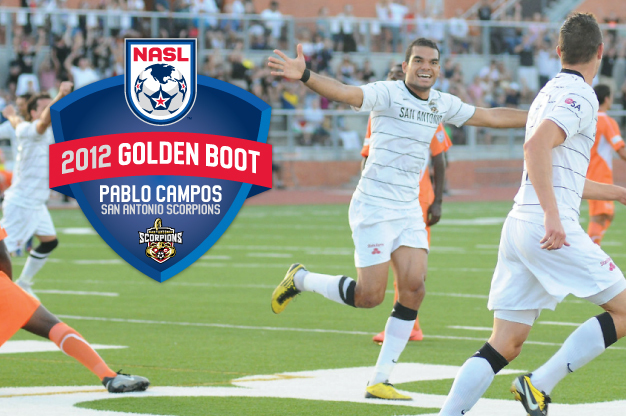 Campos’ 20 tallies equal the NASL single-season record set last year by Etienne Barbara of the Carolina RailHawks, and helped lead the expansion San Antonio Scorpions to the NASL Regular Season Championship. During Campos’ stellar 2012 season he was named NASL Offensive Player of the Week on five occasions and won Player of Month honors in July. Carolina RailHawks forward Nick Zimmerman finished second in the league with 15 goals followed by Fort Lauderdale midfielder Mark Anderson who recorded 12 goals for the season. "I would like to thank and dedicate this award to my whole family. They were the reason why I could stay focused and motivated the whole way. This award wouldn't be possible without my teammates and coaches,” said Campos. Scorpions Head Coach Tim Hankinson remarked “"Pablo was a game-winner for us this year. Whether it was through great individual effort or playing off services from his teammates, he showed that he is a true goal-scorer." The 29-year-old Brazilian international joined the Scorpions from the Carolina RailHawks in January 2012. 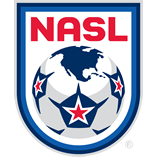 Last season, Campos was tied for the second most goals in the NASL with 12. Campos also recorded three postseason goals last season. He is first on the NASL’s career scoring list with 37 goals in all competitions, including NASL Playoffs and the Lamar Hunt US Open Cup.